With so many people transitioning to vegan and plant-based diets — especially among younger generations — college dining services find themselves playing catch-up with the burgeoning demand. Year after year, Boston University Dining Services has been upgrading its vegan offerings to accommodate its ever-growing vegan clientele. In fact, BU earned an A on peta2’s Vegan Report Card in 2015 and 2016. Here is a collection of tips, tricks and hacks that I have gleaned since arriving on campus, carefully crafted for the vegan, vegetarian or veg-curious members of the BU community. Remember to embrace whatever style of vegan makes you feel good about yourself and the footprint — or lack thereof — you are leaving behind. Keep in mind: all three dining halls — Warren, Bay State and West — serve at least one vegan entrée for each meal. 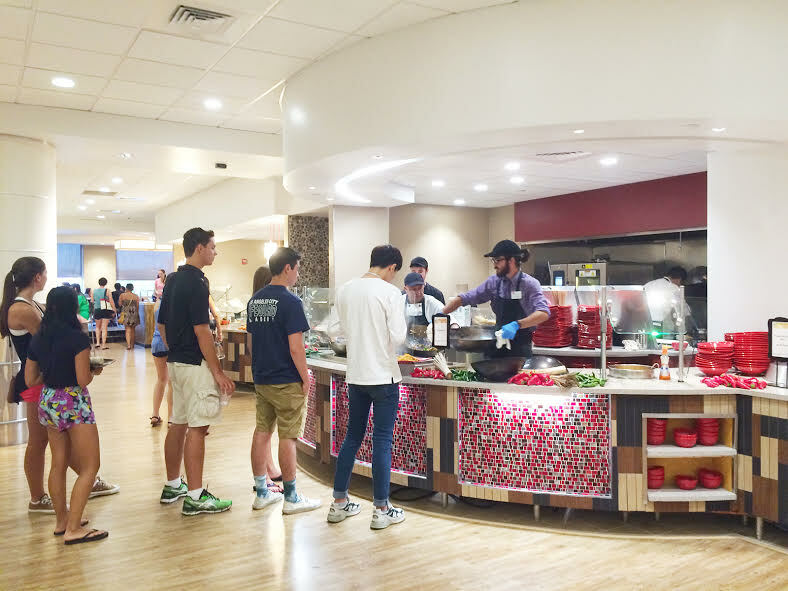 Besides the vegan entrées, the dining halls also offer salad bars, vegan bagels and fresh fruit. Located by the bagels and bread, there is an assortment of condiments, including peanut butter, jelly and Smart Balance vegan butter. The dairy butter and Smart Balance are often right next to each other, and if they’re not labeled, the softer one is probably the Smart Balance. At Warren, you can ask a server behind the counter for vegan cream cheese. Don’t be afraid to ask the dining hall staff if you have any ingredient-related questions. Just because a dining hall station is serving meat, dairy or eggs doesn’t mean they don’t have vegan sides, like rice, beans or steamed veggies. If the vegan option doesn’t cut it for you, you can make your own meal by mixing and matching sides and salad bar options. The dining halls have microwaves, so you can throw veggies, starches and grains into a bowl and steam them. If the sides aren’t labeled with the indicative green “V” sign, you can ask the server just to make sure. If you’re short on time before class or don’t feel like trekking to a dining hall, stock your dorm room with easy-to-prepare vegan grub. Many students keep utensils and plates in their rooms for this purpose. You can stock oats, chips and salsa or hummus, plant-based milks and my personal favorite: Dr. McDougall’s Right Foods ready-made soups and ramen, which I order in bulk online. Local markets that carry these staples include Buick Street Market, Trader Joe’s, Star Market and Whole Foods Market. Since some of these items are perishable, it’s ideal to have a MicroFridge in your room. Also, dining halls allow you to leave with a couple pieces of fruit, so I’d recommend using this opportunity to stock up on bananas, oranges and apples. Most students are unaware that the Hillel building has its own dining hall. Otherwise, they may assume it caters only to those on a kosher or specialty dining plan. However, Hillel’s dining hall is open to all students, regardless of their meal plan. It offers high-quality food with plenty of options for veggie lovers. Since the dining hall is kosher, meaning they separate all milk and meat products, it is easy to detect vegan versus non-vegan — just watch out for eggs. The GSU offers ample vegan options. At Rhett’s, the Vegan Delight bagel sandwich topped with tofu cream cheese and veggies is a personal favorite, but any of their Grain Bowls or bagels are vegan-friendly. The GSU also carries veggie sushi with brown rice, vegan cookies and cakes, Macro Vegetarian packaged noodles, and fruit. The GSU Starbucks — as with all Starbucks locations on campus — carries soy, almond and coconut milk, so you can veganize most of their drinks. Pinkberry often has a vegan coconut flavor that you can top with any combination of toppings. One of the benefits of living in a city is the endless list of local vegan-friendly food stops. From the diner-style Veggie Galaxy to the raw vegan Cocobeet, apps like Yelp and HappyCow are inundated with vegan offerings in the Boston area. Just finished a tough midterm? Hit up a FoMu for a plant-based ice cream treat. Craving Asian cuisine? Check out My Thai Vegan Cafe, Cuong’s Vegan or Grasshopper Restaurant. Want something quick but tasty? Stop by a Clover Food Lab or by CHLOE. Whether it be a health, environmental or animal welfare reason — or any combination of the three — some compelling factor initially drew you to veganism. It’s helpful to periodically remind yourself why you chose this lifestyle, and rest assured you chose a vegan-friendly school.